On An Overgrown Path: Have you had a similar experience to Lutoslawski? Have you had a similar experience to Lutoslawski? In addition, the interviews highlight...the tremendous significance of the radio as a provider of inspiration. 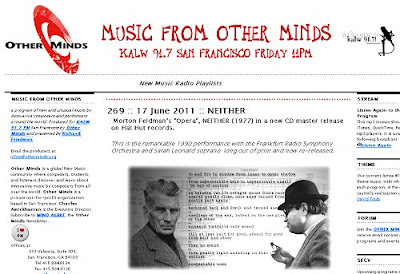 Nowadays when radio stations are starved of financial resources and tend to ignore minority interests (which contemporary music no doubt represents), the statements of many composers regarding the fundamental role music broadcasts have played in their lives ought to make editors stop to ponder whether they are doing the right thing. Have you had an experience similar to Witold Lutoslawski's? He heard John Cage's Second Piano Concerto on the radio - an encounter which changed his musical thinking and ushered in a new creative period, the first result of which was his Jeux vénitiens. Instead of making this post yet another lament for the good old days of radio let's turn it into a celebration of the power of the medium. Lutoslawski heard Cage on the radio and the direction of contemporary music changed. Are any readers prepared to share similar but more modest encounters that changed their musical thinking? Here is my starter for ten - driving to work in 1975 I was knocked sideways by the music that was being played on BBC Radio 3. It was Edmund Rubbra's Fifth Symphony. That chance encounter with a composer I was not familiar with took me down a musical path that has resonated far beyond this little blog. Have you had a similar experience? I don't think I have quite such a profound radio moment to share, but I do think that radio offers an unparalleled opportunity for accidental ‘blind’ listening – so many times I’ve switched on mid-programme while something unfamiliar plays, and for some reason I find that the totally unfamiliar leads my ear into a deeper kind of listening than is possible when I know exactly what I’m hearing. I remember switching on just at the point in Beethoven’s Op.110 sonata (which I didn’t know at the time) when the great low bell-like chords resound in the last movement and I was transfixed. "John Cage's Second Piano Concerto"
As interesting as this book may be, it's something like this that keeps me from spending a lot of money to buy it. Varga is a publisher who has worked for the most important contemporary music houses in Hungary and Austria and this book is published by a big name house in music-related titles with, presumably a good staff of editors, and they can't get the name of a piece right. Cage did not write a Second Piano Concerto. He wrote one Concerto for Prepared Piano and Chamber Orchestra and a Concert for Piano and Orchestra (note that that's a Concert and not a Concerto), but no work of the title Varga mentions. As a publisher, he certainly should have been capable of consulting —or having an employee consult — the catalog of a competing publisher to ascertain the correct name of the piece. I don't mean to be picayune, but knowing precisely which work of Cage's was the point of reference makes a difference in understanding the question, and, sadly in the case of Cage, the literature is rather rich in spurious anecdotes and fictional attributions of characteristics to works that may themselves actually be fictional. If we take music seriously and wish for the wider world to appreciate it better, this kind of sloppiness is unnecessary. And, needless to say, this lack of care may reflect poorly on the fidelity of the editions published by the author. But I do feel you are somewhat overreacting. Bálint András Vargase refers to the "Second Piano Concerto" in the Preface. But in the interview with Lutoslawski in the book the references are to Cage's "Piano Concerto". Yes, it is an error/ambiguity that should have been picked up. But does it really justify such a stream of invective and statements such as "needless to say, this lack of care may reflect poorly on the fidelity of the editions published by the author"? There is much to learn from Three Questions to Sixty-Five Composers despite this slip. My Road To Damascus experience, more years ago than I care to remember, was about performance rather than composition. Like many music students I believed that each piece had an ideal interpretation against which performances could be measured, assessed and criticised. That belief was shattered by an unlikely encounter on Radio 3 - Fritz Wunderlich performing Britten's Serenade for Tenor Horn and Strings. I can remember very little about the performance now, except that it was unlike the Peter Pears recording I knew and loved in just about every way. What I remember very clearly was the instant realisation that two interpretations of the same work could be radically different but equally valid. It changed my approach to music as a listener and as a performer. Circa 1988, I found myself watching a TV documentary about Messiaen (then still alive), in whose work I had previous had no interest. I found it riveting, and it changed my life forever. If I hadn't happened to be watching the telly that evening, I would have been greatly impoverished as a result. Circa 1988, I found myself watching a TV documentary about Messiaen (then still alive), in whose work I had previously had no interest. I found it riveting, and it changed my life forever. If I hadn't happened to be in front of the telly by pure chance that evening, I would have been greatly impoverished as a result. In June 1980 , our local public radio station broadcast the New Music America festival late every night for a week, so I stayed up and heard Laurie Anderson, Diamanda Galas, and other beginnings of what grew into the Downtown music. A pivotal moment in my personal music history. I am the founding (and current) editor of the series in which Balint Varga's book appeared (Eastman Studies in Music, published by University of Rochester Press). It was my decision, and I stand by it, to allow Balint to refer casually to Cage's "Second Piano Concerto" in the first of his three questions to the 65 composers. We could hardly change the wording of that question, which he had asked dozens of composers over the course of several decades. I figured he had used the phrase in order to quickly distinguish the Concert for Piano and Orchestra from the Concerto for Prepared Piano and Chamber Orchestra. Nonetheless, Balint and I made sure that, in the book's index, the correct name of the work would be given in parentheses. The prepared-piano concerto has its own index entry, clearly distinguished from the "second" concerto (or non-concerto). Thus there is no problem "knowing precisely which work of Cage's was the point of reference" (to quote Daniel Wolf's objection). A nickname or casual reference is not an error: it's simply another kind of usage that has developed (as Pliable notes in referring to a CD of "the Piano Concertos" of Cage). Beethoven didn't write a Moonlight Sonata or Chopin a Raindrop Prelude. But musicians and concert programmers develop their own shorthand--however inauthentic or inaccurate--in order to make sure everybody knows which piece they have in mind when they're talking about it or planning on performing it.